Our range of products include transparent tissue culture container. 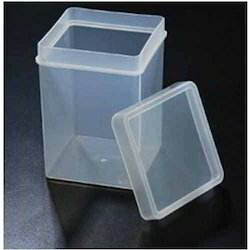 Transparent Tissue Culture Container solutions offered are autoclavable Tissue Culture Containers that come with unique cap and drip ring that makes these containers ideal choice for end applications in plant tissue culture field. For durable finish, these are made available in transparent polycarbonate body with polypropylene cap. Here, the presence of a side tube in autoclavable container with silicone membrane on cap also allows change/addition of growth medium without providing any disturbance to the contents. Further, all stages of plant tissue culture can be completed in single vessel without requirement of transferring tissue from one vessel to another with a floating explant holder also at the same time helping in keeping the tissue in constant contact with the medium. Looking for TISSUE CULTURE CONTAINERS ?